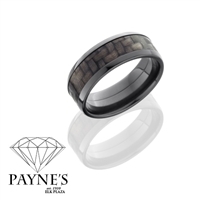 9mm Black Zirconium polished band with carbon fiber inlay. Sized to fit-call for sizing and delivery-time information. Elegant yellow and white diamond teardrop-shape pendant in 14K two tone white and yellow gold with 18" 14K white gold chain.